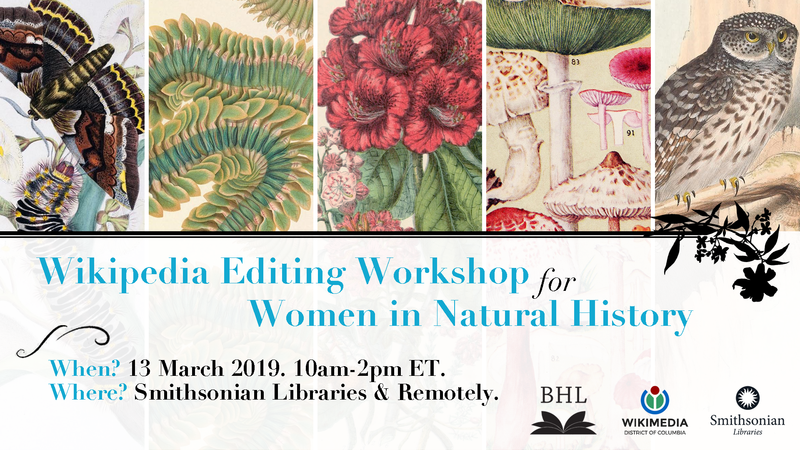 In collaboration with the Biodiversity Heritage Library and with support from Wikimedia DC, we’ll be hosting a Wikipedia Editing Workshop from 10am-2pm ET on 13 March 2019 to improve and create Wikipedia articles related to women in natural history. The workshop will be hosted in the National Museum of Natural History Library. There will also be virtual participation options. Registration is required. See a summary of workshop details and information on how to register below. We hope you’ll join us! The illustrations featured in this graphic were created by women who will be featured in our Wikipedia Editing Workshop. From left to right: Harriet Scott Morgan, Australian lepidoptera and their transformations, v. 1 (1864); Roberta McIntosh, A monograph of the British marine annelids, v.2, pt.2 (1910); Elizabeth Twining, Illustrations of the natural orders of plants with groups and descriptions, v. 2 (1868); Mary Emily Eaton, Field book of common gilled mushrooms (1928); Elizabeth Gould, The Birds of Europe, v. 1 (1837). With the help of experienced Wikipedians, attendees will learn to edit Wikipedia and improve or create Wikipedia articles related to women in natural history, drawing on the Biodiversity Heritage Library’s free and extensive online collections as source materials. No editing experience is necessary. Attending in person? Laptops are required. Please bring your own. Wikimedia has two laptops to loan. Reserve one by emailing info@wikimediadc.org. This event is free and open to the public, but space is limited, so register today. Lunch will be provided. Attending remotely? There will be an option to participate in the editing workshop remotely. Register to attend remotely and stay tuned for more details in the coming weeks. This workshop is hosted by the Biodiversity Heritage Library and Smithsonian Libraries with support from Wikimedia DC. It is being produced as part of a larger celebration around women in natural history that BHL and our partners are organizing for Women’s History Month. Stay tuned for more details about additional events and programming coming this March! Great initiative! Congratulations. I’m curious to see how it turned out!